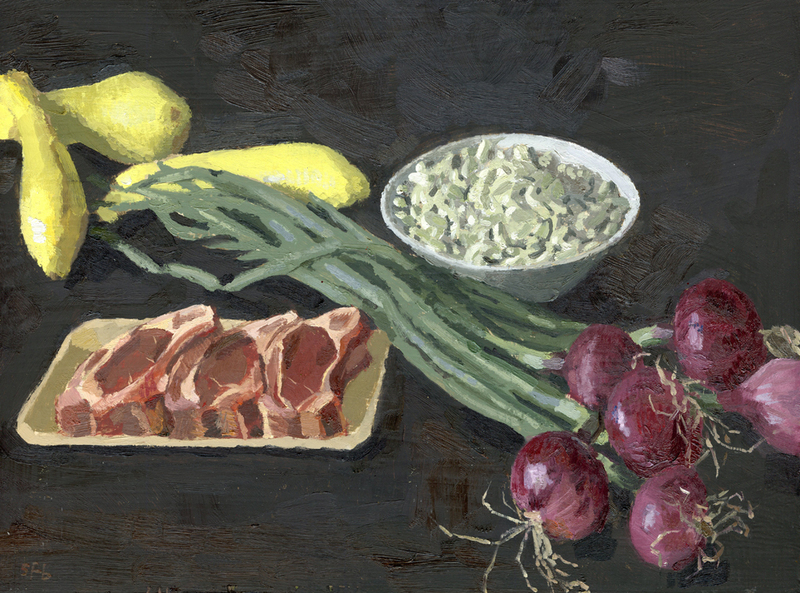 I’m heading in to Smithfields today to hang this Lamb Chop painting to replace the Ribeye that sold. Those things in the bowl are white beans, by the way. I realized it would be hard to identify them when I set up the still life, but went ahead and painted them anyway. They were such beautiful fresh white beans from Idaho. The onions were pretty amazing too. I planned this painting so I could actually eat the meat when I was finished painting it. I started with them first, then stuck them back in the fridge and finished the rest. I thought the white beans were cashews. Oops! Maybe if I viewed the original and on a small screen they would have looked like white beans. It’s beatiful, I love it. A beautiful painting Sarah. Congratulations on your sale too!